So. I’ve made it to 16 weeks! I thought surely when I made it to 14 weeks I would relax. Then 14 weeks came and went. I am now at 16 weeks and am still just as nervous and fearful as I was at 6 weeks. I am trying. I am really trying to enjoy this pregnancy. But I feel like I’ve been robbed. Robbed of the joy that pregnancy brings. There are days when I do forget and am happy but more often than not even on those days when I am glowing with happiness lurking in the dark corners of my mind is the fear. Recurrent miscarriages will do that to a person I suppose. The problem is I have definitely hit the second trimester high. All those nasty first trimester pregnancy symptoms are gone. I’m not sick, no more food aversions, I’m not tired anymore, and I have way more energy. In short, I feel like my old self again. I just feel like me, not a pregnant version of me. Most women can’t wait to get to this stage. But the problem is my baby is still too small for me to feel any movement and that makes me wonder. I don’t feel bad anymore and I don’t feel a baby…is everything okay in there? My other fear stems from the fact that I don’t have typical miscarriages. I don’t get cramps and bleed. I have what you call missed miscarriages (which I’m told is very rare.) Meaning the baby dies and then my body for whatever reason holds onto the baby. My first miscarriage happened 3 weeks before and I found out when there was no heartbeat on an ultrasound. The second time it was the same thing only it was 2 weeks when I found out not 3. That scares me. Because my body doesn’t traditionally miscarry in the way you would think. 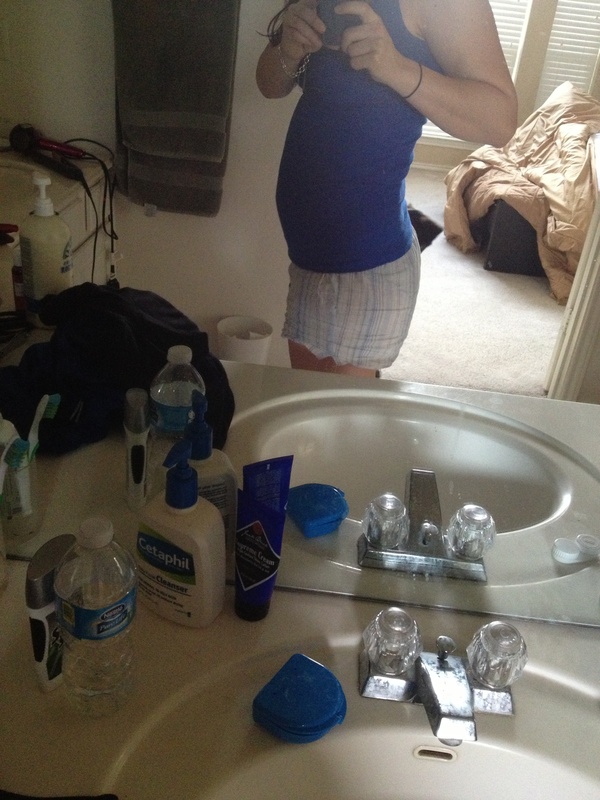 And since my pregnancy symptoms have lessened and I can’t feel the baby move yet….I worry. I guess what I am slowly starting to realize is that there will always be another milestone to get to. I can say well when I get to 20 weeks I will feel better. But you know what? When I get to 20 weeks I will say if I can get to 24 I will stop worrying. The truth is I am going to worry until I give birth. And then a whole new set of worries will kick in because I will have a BABY! I don’t think I will ever not worry. So the issue becomes how to cope and manage that worry? I almost feel like I need to give myself permission to worry and not beat myself up about it. But I also need to find the balance between a healthy amount of worry and an unhealthy amount. Sobbing so hard I start hiccuping? Not a healthy amount of worry. Googling every little thing? Not a healthy amount of worry. I do visualization and that helps. It always makes me feel good and it makes me smile seeing, in my mind, a healthy baby. I talk to my baby all the time. I reassure him/her that this is a safe place and that we love him/her very much. I tell the baby to take whatever it needs from me to grow strong and healthy. I pray all the time for the baby and I make the effort to try and think two good thoughts whenever a bad thought enters my mind. It isn’t easy and I don’t always succeed on that last one. But I’m trying. I’m really trying to hold it together, believe that this will happen, trust in my body, in God, and in my baby. I’ve never wanted anything more. I feel the exact same way (except that I am not pregnant yet) about being robbed from enjoying pregnancy. It’s really not fair. But I guess you just have to focus on it one day at a time. I had a missed miscarriage too except that I did start to bleed like a week or so after the baby stopped growing. I never cramped though. I say, give yourself a few minutes a day to worry (without feeling bad about it) and then give your worries to God for the rest of the day. Easier said then done, I know but he can take over for you while you try and enjoy your pregnancy. I haven’t had a miscarriage but two of my best friends did at the same time I was pregnant. While I don’t know exactly what they went through, I was so worried about why they lost their babies and I didn’t. I kept thinking something bad was going to happen to mine too. Thanks Megan. I appreciate it so much. Hearing from moms that have been in this position makes me feel so much better. It helped me a lot. I was the queen of google, which was a big mistake. I felt the baby move eating pizza in San Francisco on a business trip (random) at about 17 weeks? Once I did, it did not stop. Once the baby gets bigger, you can do fun stuff like eat ice or really cold things to get them to move. I know I did!! You will never stop worrying, you just have to learn to live with it and not let it take over. You are right that there will always be another milestone you are waiting to get to. Talking helps, to a friend or therapist. There are also therapists who specialize in pregnancy and fertility and post-partum issues. I’m happy to listen too! For me, it helped to trust myself that I was doing all I could to give the baby a good place to grow, and you have to trust in a higher power for the rest. Thank you so much for commenting Amber. It means a lot to me! I pray for you often. My doctor is awesome and let’s me call or come in if I need to. So far I’ve only had one flip out and he was very understanding. This is the same OBGYN I’ve had through everything and he tells me all the time that I am acting very normally for my situation. It’s funny because I just keep saying that I want to feel the baby move! But I know once that happens I will get worried when one day there is less movement or no movement for a period of time. I know there will always be worrying and I can not imagine what I be like as a mom! Ha! Your little boy is absolutely precious and I know this pregnancy is going to work out for you! I just know it!! Hi Kelly, I have everything crossed for you -babies bring a lot of stress and worry, especially after many losses. I don’t know how you and keith would feel about it, but Donita and I rented a doppler and that really helped with the stress and paranoia. It was only $20 a month from http://www.storkradio.com/ and every few nights when we’d worry I’d reach for it and listen to Evie’s heart beat..it was really comforting! Thanks David. We’ve thought about it but my doctor cautioned us that sometimes the heartbeat can be hard to find and he was worried that it might freak me out eve more. But I am seriously considering it because the wait time in between appointments is awful. I wish I could offer some bit of encouragement, but I know how it feels and I know that it’s hard. When I was pregnant with Weston I had placenta previa, which meant that my placenta was between my stomach wall and Wes, so I didn’t feel him moving for a lot longer than most women. It was horrible – but always a solid reminder to have some faith. I worried every day I was pregnant with Max. Not only that, for some reason I bled through most of that pregnancy which only made things worse for me. There really is no way to truly relax when you’ve been through so many miscarriages. I guess all you can really do is hope that things continue to move in the right direction and stay as positive as you can. I’m thinking about you and the little one! Love that little baby belly. So sweet! Oh my gosh Sarena, I can’t not imagine your anxiety with the bleeding. That would be so scary. Thankfully Max is a beautiful boy who made it through!! I’ve been reading your blog for a while, but due to college, I wasn’t able to read as regularly. I’ve been praying for a long while that you and Keith would be able to conceive, and I am not lying when I say that I started crying when I saw your little belly in that picture. I am so happy for you!! I will continue praying that your pregnancy goes well, and again I’m so happy for you!! Thank you so much!!! You made me tear up. I appreciate all the kind words, prayers and well wishes. Truly! Oh my! I’m just catching up with your blog and was so very happy to read your good news. I’ve been rooting for you two! I miscarried twice between my daughter and son and, as a result, was very anxious and worried for almost the entire pregnancy with my boy. I have no advice, other than knowing you’re not alone. I’ll keep you in my prayers – you and your cute little belly! Congratulations! I have read about your journey- and I have to say- it helped me so much! We tried to get pregnant for two years with one miscarriage (also a missed miscarriage) in between. Here I am- 23 weeks!! Know that you will feel more comfortable. I was really nervous through about 14 weeks because I still wasn’t feeling great. Weeks 15-16 came & went- nerves started slipping away. Slowly, but surely, I got excited! What wonderful news for you! Congratulations to you too!!!! That is very exciting news!